Cutting your dog’s nails is tricky business for both us and them. The first time I tried to do this I was super nervous and clipped my poor puppies nail too short – right down to the quick … in no time at all there was blood everywhere and both of us were howling! We have since got better at it, but there are a few things I have learned along the way that may help you if it’s your first time clipping dog nails, or if like me, this still gives you terrible anxiety! Why do I need to cut my dogs nails? It’s often something that we leave to the last minute for many reasons such as fear or a fussy dog. For certain breeds of dog that are very active and exercise a lot on hard surfaces then you might not need to intervene with the dog nail clippers – they may be worn down naturally. 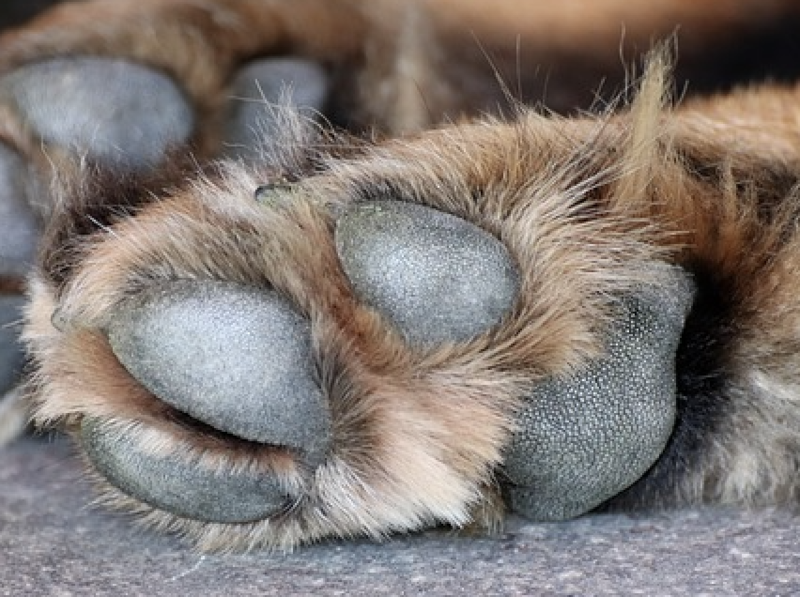 Sore paws – when a dogs long nails come repeatedly into contact with hard unforgiving surfaces such as stone or tiled floors the nail can get pushed back up into the nail bed, forcing the toes in the paw to twist or absorb a lot of pressure. This will be painful for pups and make them likely to run in the other direction as soon as you whip out the nail clippers!!! If left untreated then your dog can end up overcompensating with his posture to keep his nails from hitting the ground – this is called “Goat on a Rock” which puts a strain on the dog’s muscles and joints causing them pain and problems as they grow older. 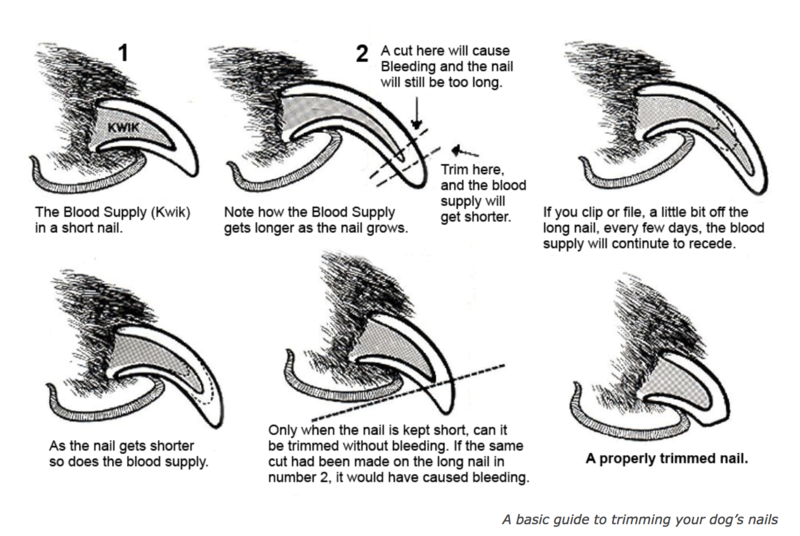 By keeping your dog’s nails clipped you can avoid this distressing condition for them. So what are the best ways of doing this and what do you need to consider? Some dogs are happy to be held, retrained and handled by their owner or trusted vet or family member, but not all dogs are lucky to have this temperament or have had sufficient socializing to get them to this position of trust. Dogs that are naturally nervous or that have had negative or damaging experiences with humans can find any form of restraining very traumatic. With a wriggly or scared dog, the situation can often end up being distressing for both you. If you accidentally cut down to the sensitive tissue before the nails – the quick – (like I did) your dog will get a sharp shock, and likely be quite sore. It also bleeds a lot. So if this happens when you are clipping your dogs nails then you may end up making the situation worse. Your dog may even snap or bite out of fear and uncertainty. Whenever possible if you have a young dog or a puppy is it advisable to socialize them and get them used to this kind of this as much as possible, as early as possible. Pick them up, hold them close, play with and touch sensitive parts of them such as ears, teeth, paws, and nails, and tail to get them used to it, and crucially to build up trust between you. By creating lots of positive memories between you when it comes to these important moments your dog will trust you when it’s time to trim those nails and will be calmer, and therefore less likely to wriggle or complain. If your dog is already a little older, then do not despair – you may just need to take it slower, be freer with the treats and rewards and build up to it over a longer period of time. Be patient and hang on in there and you will see progress if your dog is a little nervous or shy. Dogs that have has a negative experience or that have been physically or emotionally damaged may require expert help to have their nails clipped and you may need to visit a professional or your vet. It’s super important that you select the right size and design for your dog. We advise from experience to use only scissor style dog nail clippers. The guillotine style clippers can be painful as they squash the nail during the cutting process. Consider the size of your dog – small clippers give you more control – if you have a large breed of dog then you might need a bigger set. Next – ensure that they are sharp – you can risk damaging or soiling the nails if you use poor quality, weak or blunt clippers. You can also consider using a pumice stone to round off any sharp edges or to file down the last little bit of nail if you don’t want to risk cutting too close. You can read about our favorite dog nail clippers here. 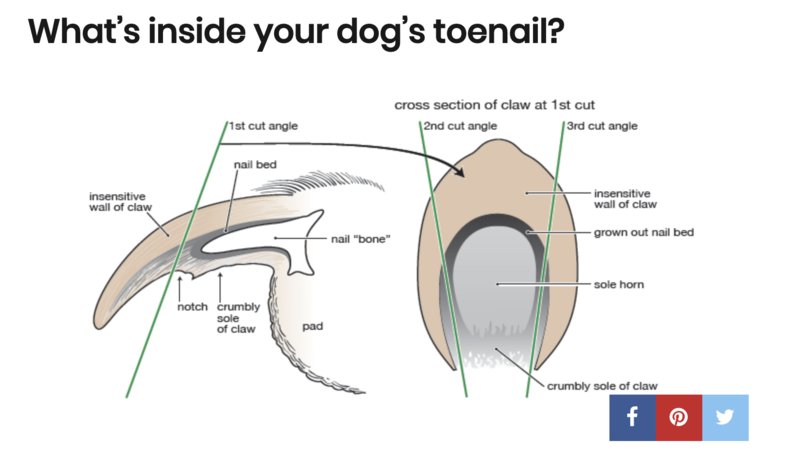 It helped me enormously to spend a few minutes researching the composition of a dogs nail. Understanding where the blood vessels are and the differences between parts of the nail made it easier for me to understand where I should be cutting. This great image from Dogs Naturally Magazine really helped me visualize where I should and should not be cutting! The most important part of the technique is to make sure you have a good supply of treats to hand! This is key to ensuring your dog starts to recognize this as a pleasant and enjoyable activity. Separate your pups toes gently and trim any hair that he might have between his toes to may it easy to see what you are doing. Begin by holding the nails trimmers flat against the paw and make a cut straight across the nail. Pro tip 1 – squeeze gently with the clippers to apply a gentle pressure without actually cutting. If your dog reacts then it’s possible you are close to the sensitive part – the quick – and that you need to readjust your position to further down the nail. If there is no reaction to the squeeze then you are good to go! If your clippers are nice and sharp there should be no trouble here. To get a slightly shorter nail you can either use a pumice stone or a file to finish off or cut at an angle once you have gained a bit of confidence. This diagram here is super at helping to visualize where to cut. Pro tip 2 – If your dog has black nails then underneath you will see that at the very tip of the dogs nail you can see the two outer walls in a triangle shape and its safe to cut here because there is no quick there. What do I do if I cut into the quick? Don’t panic. Distract your pup with a treat or two and do not wipe away the blood if it is just a small amount as this will help with clotting. If the nail continues to bleed or there is alot of blood then you can dab some baking soda or cornstarch gently on to the nail. Repeat this a few times and compress the nail with cloth until the blood stops flowing. Do I have to do them all at once? No. Start with the paws on the back legs, do one nail at a time and see how you go. The nails on the back are less sensitive than the front so this will introduce your dog to the process gradually. How often do I need to clip my dog’s nails? Depending on where you live and exercise your dog then you should be checking and trimming then every 2-3 weeks. Can I give too many treats? Treats are crucial here – you will not spoil your dog by being generous with these and make distract him entirely from what’s going on! Take it slowly, take it easy and be aware of how your pup is feeling and you should have no troubles here. I’d love to hear about any tips tricks and hacks you might have for cutting your dogs nails and what works for you.